DESCRIPTION: This is a website for Boxscore Sports to administer and manage their unique fantasy leagues for football and baseball primarily but also for other major sports leagues. 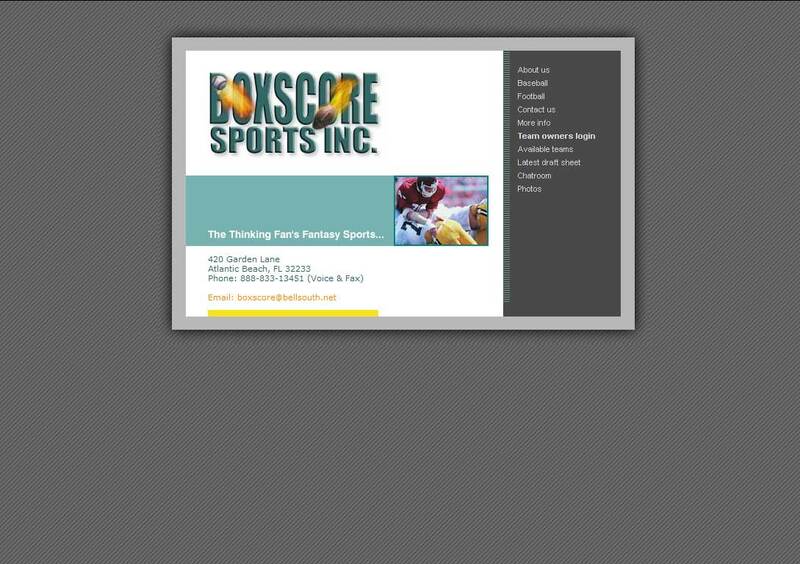 You can find out more by going directly to their personal website, www.boxscoresports.com, or contact him directly at boxscore@bellsouth.net or 888-833-9451. When we needed to develop a web presence to congregate and assemble our fantasy football and baseball leagues online, PTC Computer Solutions was willing to step forward and help us out with an incredible understanding of web database development through MySQL and SQL queries and PHP development as well as working with our existing ASP and ASP.NET development. They are the best Jacksonville, Florida based website design and development company and have been in Jacksonville longer than any other existing company. They know the Internet, computer programming, website design and how to set up a website as well as how to generate buzz and Search Engine awareness through social networking and other online marketing means. Contact PTC Computer Solutions at info@ptccomputersolutions.com if you are interested in your own quality website design.